April Fun Foodie & Spring Finds! 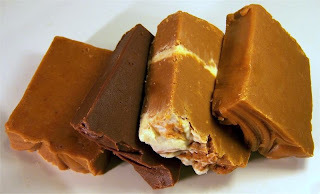 We loved this fudge because the flavors are not like your usual fudge flavors found at typical candy shops. Their Scottish twist with liquor is fun for adults and kids can enjoy the non-alcoholic laced ones too! If you're a fan of fudge like we are, you can win yourself a sampling of The Mill Fudge Factory Fudge too... Sign up for their email newsletter here in order to enter you chance to win! And even if you don't win the fudge sampler, you'll receive a 10% off coupon for your purchase on their website. It's definitely a sweet win-win for all! If you've got family members that need more vegetables in their diet, this steamer is great. I've found steaming vegetables has been a favorite at our house and it retains more nutritional value compared to preparing the vegetables in other ways. Forget those steaming vegetable pouches for the microwave... they're already expensive enough. 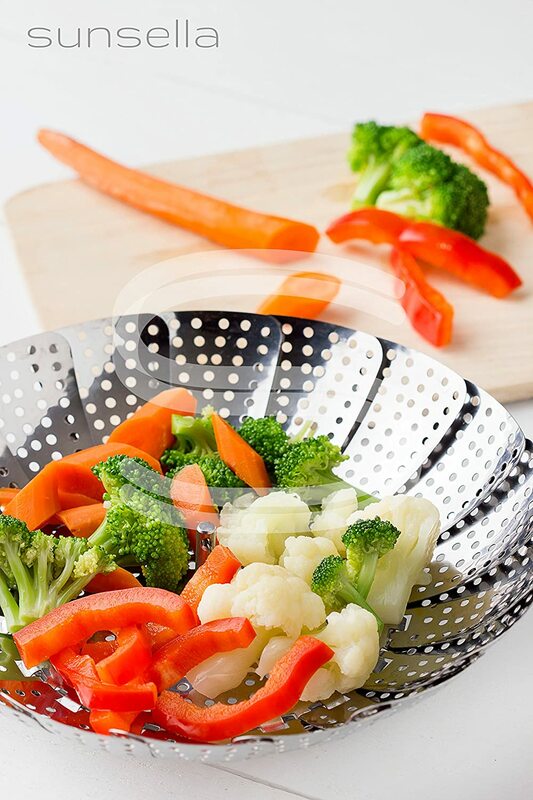 This steamer is 100% stainless steel (including legs) and is made out of high-grade stainless steel. I love that it expands to fit various pot sizes and collapses for easy storage taking up less space. Aside from vegetables, I've used mine to steam tamales, prepare dim sum, make batches of hard boiled eggs, and even used it as a colander for small portions of food. Every kitchen needs a sharp knife! Did you know that more accidents happen in the kitchen with a dull knife than a sharp one? I recently had a chance to trey out the Dalstrong Infinity Blade. This blade is crafted in a state of the art facility using the latest technology. The blades are placed in a sintering kiln at 1500°C for 4 days delivering superior uniformity & higher density. Expert craftsmen then hand polish the knives to an edge angle within 11°-13°, & cutting edge of 35°-42°, creating a blade that is 30% sharper than competitors. Finally a strict 10-step quality control procedure ensures a premium product. I love how the blade glides effortlessly through meat & produce thanks to a blade up to up to 2x SHARPER than steel & near diamond hardness. As a result of their sharpness, they don't need to be sharpened as often and there's no hassle in sending your knife away. The blade holds it's edge as much as 15 TIMES longer than steel. The blade also has has a hand-polished mirror finish that doesn't rust. This blade also comes beautifully packaged and includes the 8" blade, an Edgelast sharpener, a protective sheath, and polishing cloth. Spring is the time of year we open up the windows, bake up some pastries and dust off our teasets! I recently got this new china teaset and love how clean, simple and efficient it is. The modern and elegant design is such that it looks great when in use and even when stored away. 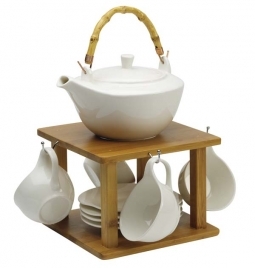 The set comes with a teapot, 4 cups with matching saucers, and a bamboo cup hanger. If you're looking to have a teaparty this spring, I highly recommend this china teaset! Thanks to White Angel, they are offering this free Bone China Teaset for a lucky reader! If you would like to receive this teaset, leave a message below with your favorite kind or flavor of tea... A winner will be chosen on Mother's Day, May 10th! Large cutting surfaces allow you to use your large knives. 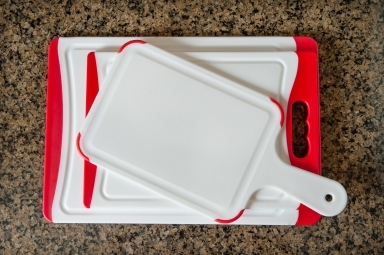 The edges of your knives will not dull when using this CC Boards cutting board set. CC Boards cutting boards offer the durability, features, and style you want! Mother's Day is just around the corner and for those that love a little bling, these crystal feathered ear jackets may be a great gift option! It's been a trend I've noticed where double sided ear jackets give the usual studs a nice change of pace. 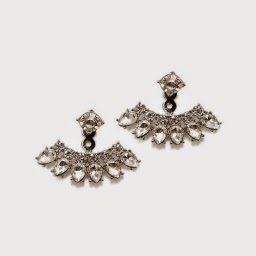 These are a bit classy and elegant where the ear jackets come with a simple round rhinestone stud. The clusters of round and teardrop shaped crystals really make a beautiful statement. Style tip: Switch out the back for a regular earring backing and you've got yourself a pair of simple studs. OR get adventurous and mix & match your own studs with the stone and rhinestone bauble backing! I'm heading to Las Vegas soon for a little girlie getaway and I've heard the thing to carry around is a selfie stick. So, I figured I'd get one to test it out and get some practice as I plan on taking quite a few pictures this summer! This selfie stick by VivaSelfie has a professional monopod extendable handheld pole which can connect to any wireless mobile phone. It's great for selfies and above the crowd shots! It has a built in shutter button designed for continuous shooting using your mobile phone and it's lightweight with a sturdy non-slip grip. At first I thought the selfie stick was a bit silly, but it really is useful. It offers the opportunity to have everyone in a group shot so no one is left out... without having to find a stranger to take your picture. It also allows you to reach over or go around walls and into narrow places to capture impossible shots and hidden views. And with parties and festivals planned, the selfie stick can take great above the crowd or videos at big events. 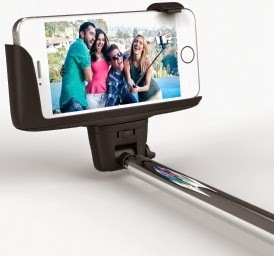 Lastly, if you're a traveler, this selfie stick will be helpful to capture those moments and views easily. My favorite kind of tea is chrysanthemum tea with rock sugar!